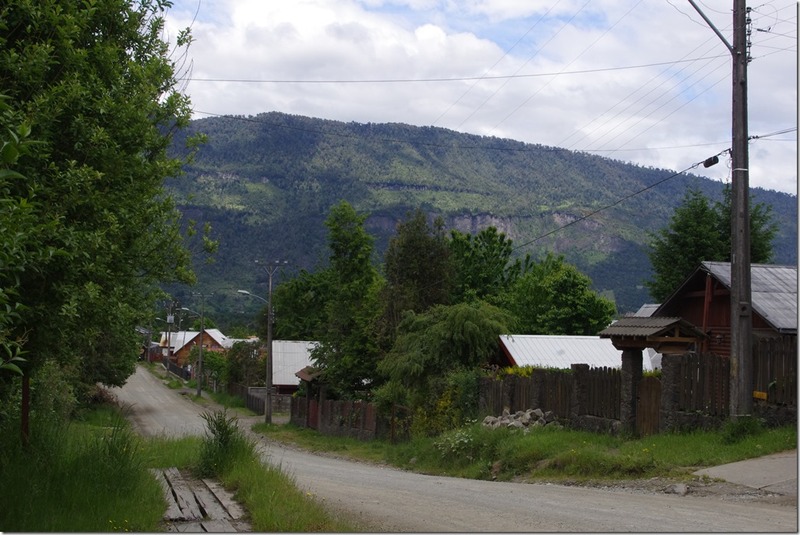 The journey from Temuco to Villarica is very straightforward and traffic was light. Ruta 5, as the Panamerican Highway is known in Chile, is a toll road but the only toll I had to pay was 2200CLP (about £2.20) just South of Temuco. Having thought that my drive (given my unfamiliarity with the hire car) was likely to be the most stressful part of the day, it turned out not to be so. I’d planned a long list of campsites to stay at but not actually reserved at any of them both to allow myself a little extra flexibility and because I know it wasn’t yet high season. Despite the fact that all the campsites on my list advertised themselves as ‘Open all year’, they were all either closed or, in one case, ‘open’ but remote and with no hot water on the site. After several drives between Villarica and Pucón (which are about 20km apart), I finally realised I wasn’t going to be able to find anywhere that was open on a cool, drizzly day and so I went looking for a hotel instead. 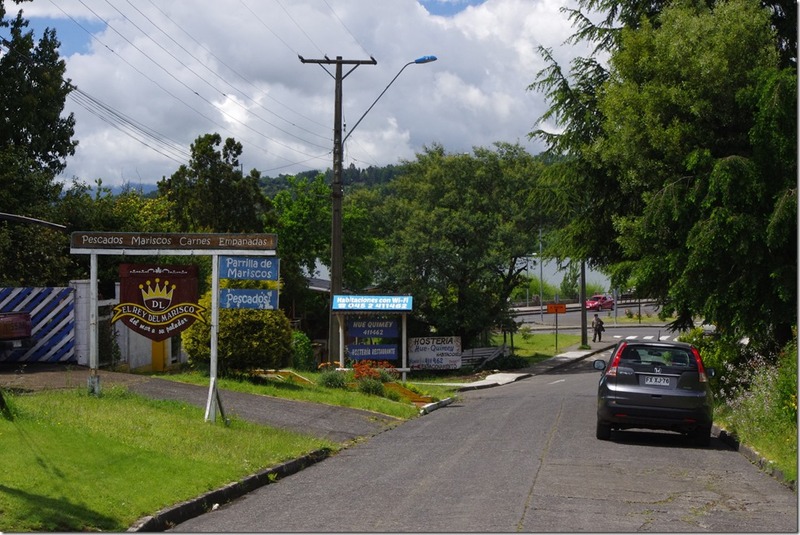 I did eventually find a hotel (which was rather more expensive than I’d have liked, but I do have a contingency budget for such things), where I could stay the night in Villarica while I looked for somewhere else. I did eventually find a campsite, and so I was able to spend three of my four planned nights under canvas. Camping Du Lac, just on the outskirts of Villarica, is quite nice and good value at only about £5 per night. On two of the nights, there was one other couple staying there, but the middle night I had the place to myself. The toilet blocks left something to be desired, both in cleanliness and functionality (more than one toilet required you to delve inside the cistern to operate some part of the mechanism!) and, despite the fact you could hear the boiler firing up when you opened the tap, I’d disagree with the owner’s assurance that there was hot water – it was tepid at best – but it was somewhere to stay. Villarica itself is quite nice. It’s one of the places Chileans come to holiday and that was evident even though it wasn’t yet high season. The town fronts onto the eponymous lake as well as being overlooked by the Volcán Villarica, one of Chile’s most active volcanoes (it last erupted in March 2015, just eight months ago). Even when dormant, it must be quite a sight on a clear day but sadly all the time I was here, the volcano was hidden by cloud. Despite being out of sight, the volcano makes its present felt nonetheless: midday is marked each day by an air-raid siren, sounded to test the town’s evacuation alarm. The holiday-makers don’t seem to mind this ever-present threat as they play in the sand, which is presumably black from a high content of volcanic ash. As mentioned, Chileans come here on holiday and the roads all around are full of Cabañas (sort of holiday rental apartments), restaurants, and other hallmarks of the tourism industry. Indeed part of my problem to find a campsite was due to the fact that when Chileans advertise a ‘Camping’, they might just mean a plot full of cabañas. There might not be any spaces for tents! In Villarica I also came across a German couple who had shipped their camper van from Germany to Canada and then gradually adventured through the Americas this far south. It was a great surprise to see a German-registered vehicle on this side of the Atlantic and their odyssey makes my journey seem comparatively modest! 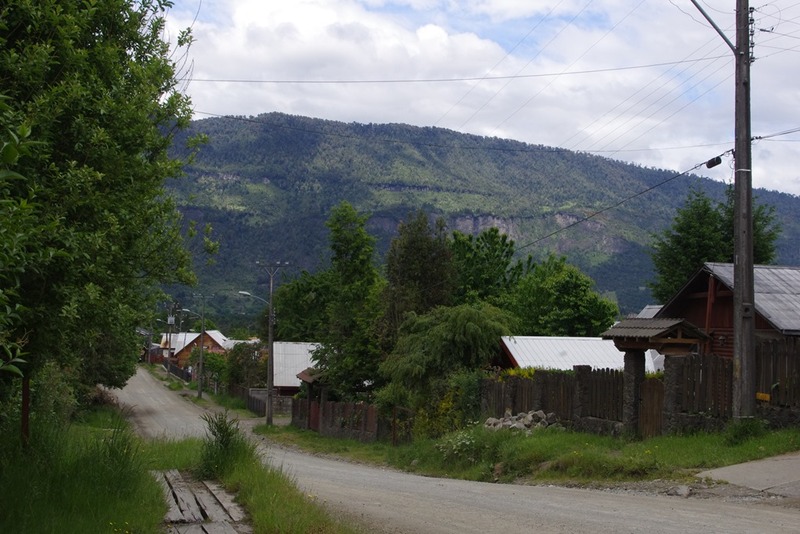 The area around Villarica was once – and still is – home to the Mapuche Indians. The town makes a rather tacit nod to that heritage in the Cultural Centre, which has an exhibition house you can visit, but it felt very empty, like something set up just for tourists. I was in the Lake District to see the lakes, of course, and having lost a day due to the campsite problem, I spent the next two days on excursions to see some of the other destinations in the area. One resource I read before coming made the bold claim that the Chilean Lake District is more spectacular than the British one. It may partly have been the overcast weather and the fact that everything looked as though it was in low season, but I have to say I felt underwhelmed. Perhaps my expectations had been raised too much. 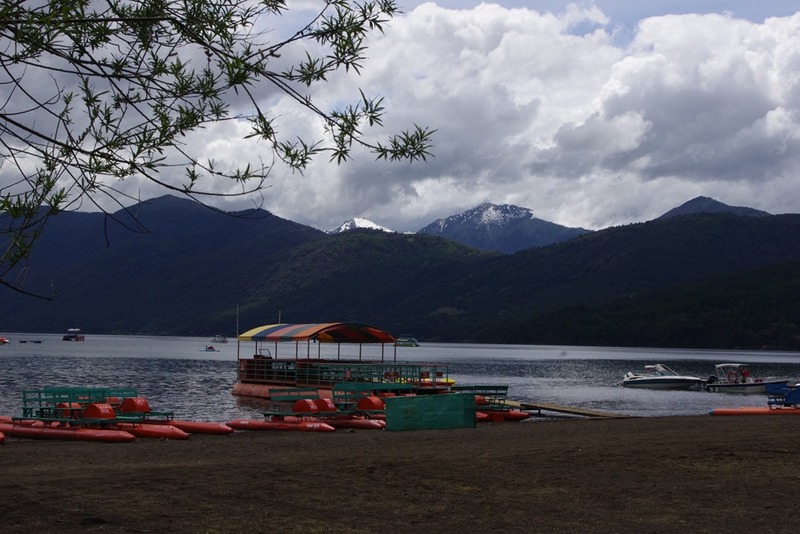 Don’t get me wrong: Lake Cabagua was pretty enough, but the boats lined up along the shore, waiting for customers who weren’t there, made the place feel lacking. 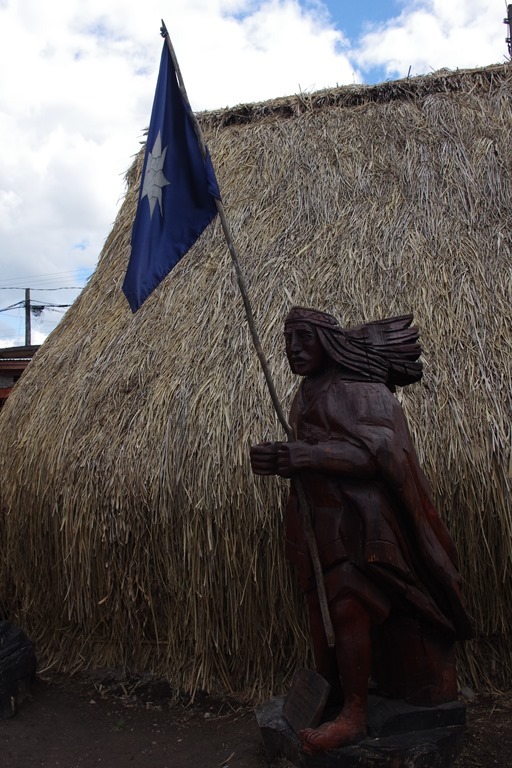 Perhaps by virtue of being a large village as well as a lakeside resort, Coñaripe was a much more interesting place to visit. 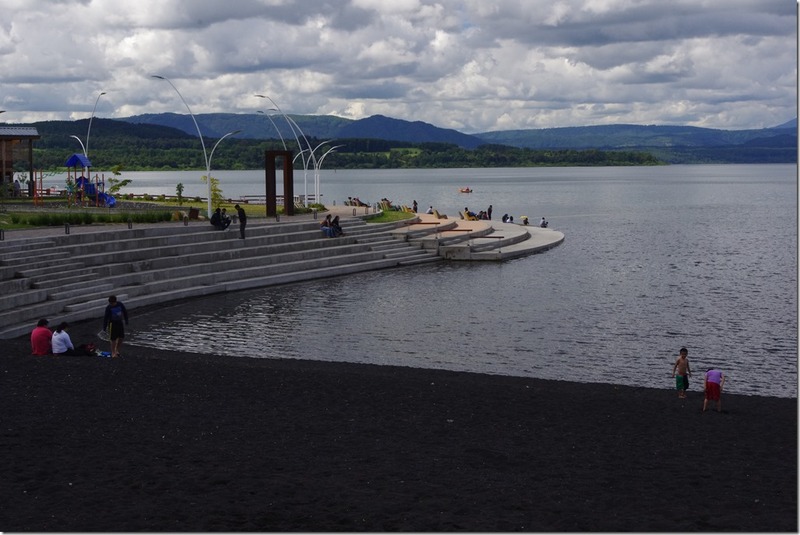 Located to the south of Villarica, it’s the picturesque meeting place of another lake, the Villarica National Park and the other side of Volcán Villarica. November 24, 2015 in chile.